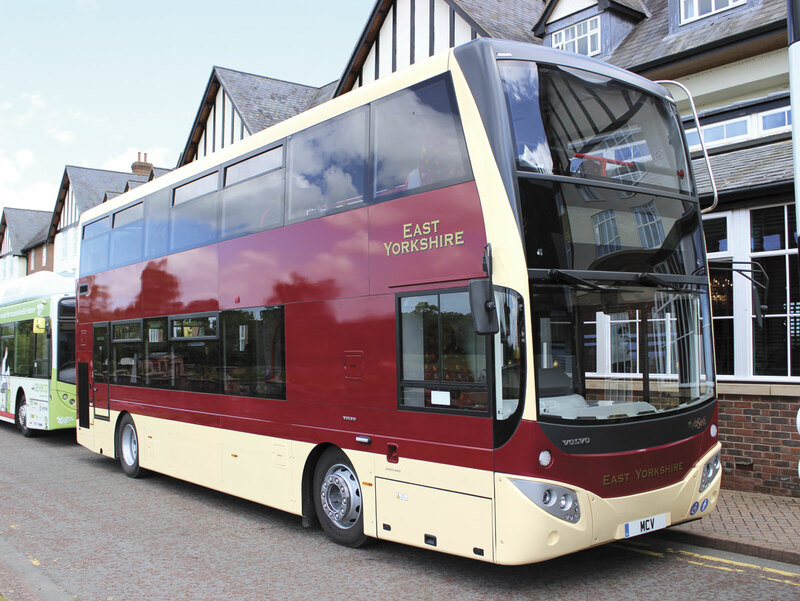 MCV promised a completely new double deck design for Euro6 and the first example made its debut in the demonstration park at the ALBUM conference in the colours of East Yorkshire Motor Services who have purchased it. Mounted exclusively on the Volvo B5TL Euro6 chassis and sold through Volvo, it succeeds the earlier MCV product which sold in limited numbers on the B9TL chassis. It incorporates a range of enhancements, significant among which is a weight reduction of over 500kg which will, along with the new chassis, help to improve fuel economy. Another key improvement is enhanced accessibility for maintenance, with traps everywhere they are needed. 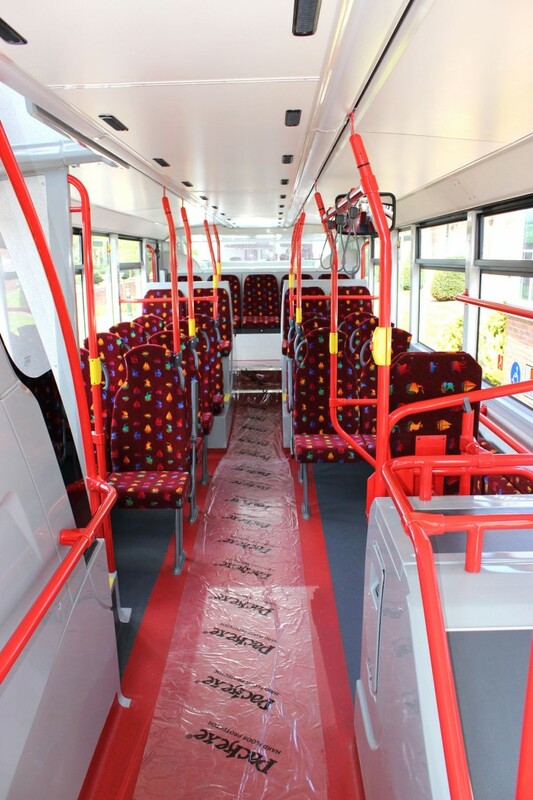 The initial bus is a single door provincial model but it can also be supplied as an open topper. To lowbridge specification measuring 4200mm, it can also alternatively be offered as a highbridge bus in which instance the overall height is 4352mm. 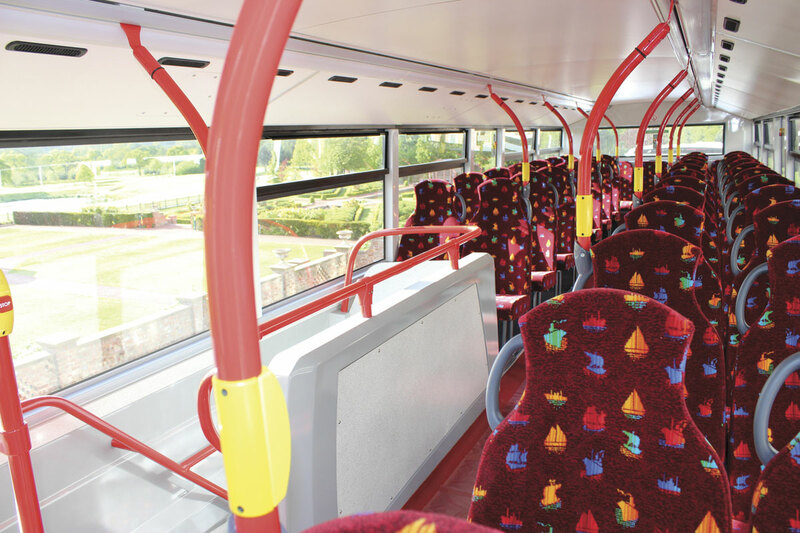 On both height variants the lower deck height remains the same, and even on the lower bus the upper deck headroom is good. With TfL’s current position on only purchasing hybrid double deckers it may be some time before we see the design in dual door format. At present MCV do not body the B5LH hybrid chassis though this is something that they are working on. Two length options are available and the EYMS example is the shorter of these at 10,439mm with a 5,400mm wheelbase. The long wheelbase variant is 6,300mm between the wheelcentres. Seating capacity is 75 (or 72 plus wheelchair) of which 45 are on the upper and 30 on the lower deck, where up to 16 standees can be accommodated. Peter Ship has specified Lazzerini Practico seats as many of his routes are long distance, though it would be possible to specify a lighter option and increase the weight saving of 500kg achieved on the new generation bus compared with the last. Passenger capacities of up to 100 are said to be possible on a provincial specification bus. Mechanically, the B5TL chassis has the Euro6 D5K 5.1-litre unit delivering 240bhp at 1,900rpm and peak torque of 918Nm at 1,200-1,600rpm. It uses both SCR and EGR technology. The transmission is the ZF 6AP1003B Ecolife six-speed fully automatic with a ZF drop centre portal rear axle. Designed using 3D CAD design systems, the bus is the first example built and was put together in the research and development centre in Cairo. Though the standard of finish was good, there were some mouldings that were not to production finish and these will be replaced once production mouldings become available. Structurally, the vehicle is constructed using aluminium framework and panelling and has a steel front frame. It carries a two-year body warranty, a five year paint warranty and a ten year structural integrity warranty from the date of delivery. The electrical centre is upstairs out of harms way, and the air tanks have now been centralised over the fuel tank beneath the stairs, as on other B5TLs. Panel replacement has been made easier and there is a wide lower deck rear window. Unlike the previous MCV double decker, which had no name, the new generation product is called the EvoSeti. The Evo part is a carry over from the single deck Evolution, while Seti was the second Pharaoh in Egypt’s 19th Dynasty (1290 – 1270BC) and was son of Ramesses 1. Apparently the word means ‘consecrated of God’. Seti himself was a Great Warrior and Military Commander who reigned for 15 years. The first Euro6 double deck EYMS has purchased, it joins four single deck B7RLE MCV Evolutions with the company. No decision has yet been made on where it will be allocated. Interior trim is in the EYMS Shipp Shape moquette pattern. Though there are a few refinements to be made Peter Shipp told me he was pleased with the bus, mentioning the inclusion of cove panels capable of taking advertisements as one of its useful features. It joins the Wright Gemini 3 and the ADL Enviro400 MMC in Volvo’s double deck body range, offering a price advantage over both.